Huge logs frame the entrance to what is more than just an average backyard garden – this garden represents the state. A visit to the Oregon Garden is more than looking at plants, or taking a stroll through the Mid-Willamette Valley. No, the garden includes many different types of activities, gift shops, events, historic sites and even a nice resort for those looking to be pampered. The Oregon Garden Resort, built and operated by Moonstone Hotels, the 103 room resort is at the top of the hill overlooking the garden’s Rediscovery Forest. With a lounge and restaurant, the craftsman-style resort was added to the garden in 2008 and is a great home base for exploring the Mid-Willamette Valley. From Silver Falls State Park, to exploring the rich art culture of downtown Silverton, or even trips into the state capitol of Salem, the Garden offers a central location. It would be easy, however, to not ever leave the grounds. With more than 80-acres to explore, and many different types of gardens, a person could easily spend a day strolling through the garden, learning about the many different plants and habitats found in the Beaver state. The staff is very friendly, and it isn’t uncommon to come across one of the garden’s volunteers -- or even horticulturists -- who are more than willing to answer questions and point out interesting aspects of the more than 20 different kinds of botanical gardens. While there is a lot of walking involved, from April through October, the garden does offer a tram that will ferry you around to different gardens. In addition, you can have lunch at the Garden Café and purchase seeds and other items at the Garden’s Gift Shop. One of the things that is a must-see at the garden is Oregon’s only Frank Lloyd Wright-designed home. The structure, which was moved to the garden, is set in a grove of Oak trees and if the unique architecture doesn’t excite you, the setting will. When you visit the garden, it’s also important to keep your eyes and ears open. From Blue Heron to Canadian Geese and other wildlife, you never know what will be around the next bend. Another can’t miss attraction at the garden is the Children’s Garden. Even if you don’t have kids, visiting the garden with a small model train, tree house, Hobbit house and area to dig for dinosaur bones, you will think you are 8-years-old again. While you might think that the garden is a Spring through Fall affair, you would be wrong. With the conifer garden, you can see what Oregon looks like year-round. In addition there are always special events, like quilt shows, auto shows and even a summer concert series with mainstream performers at the garden. “People who come here always comment about how much is going on and how this really is becoming a hub for the area,” Riemersma said. The garden got its start being educational as well as beautiful and it hasn’t strayed from that mission. There are many horticultural experiences to be had through the Garden University. Visitors can learn about wildlife, ideas for shade gardens, creating sustainable gardens and even garden art. About the Oregon Garden: The Oregon Garden welcomes visitors with more than 20 specialty gardens and features. You'll discover waterfalls, quiet ponds, fountains, a unique display of conifers, the 400-year old Signature Oak, a Northwest Garden, a pet garden, beautiful vistas and art. The Children's Garden is complete with an in-ground Hobbit house; a tree fort, furniture filled with colorful annuals, perennials and other kid-friendly plants. Kids should keep their eyes open for a new train display coming soon. What to bring: Depending on what your focus is one when you visit the garden, a sense of exploration and discovery would serve you well if your focus is on the garden. If you are visiting to enjoy the amenities of the resort, come prepared to be relaxed. From a very good restaurant and spa, to rooms with a fireplace, private patio and a great lounge, the experience is what you make it if you visit, and stay at, the Oregon Garden. Photography is allowed in the garden, and binoculars are also a good idea, especially if you enjoy bird watching. Comfortable shoes and weather-appropriate clothing is also suggested, as most of the garden is outside. 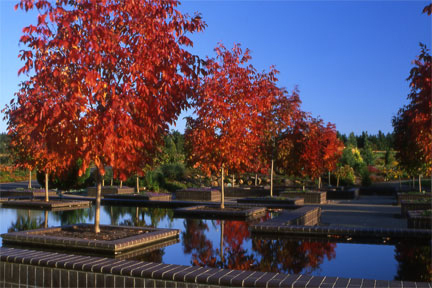 Tip: If you stay at the resort, admission to the Oregon Garden is free. In addition, if you visit during the Spring and Summer months, make sure to take the tram at least once. The site is on a hill, and if you don’t pace yourself, you can find that you get a pretty good workout strolling to entire site in a day. Season: The garden is open year-round, but there are some limited services which aren’t available during the winter months (such as the tram). Any time you visit the garden is a unique experience and depending on which season is your favorite, the garden has something to offer at any time of year. Getting there: The Oregon Garden is located along Cascade Highway 214 just outside Silverton heading to Stayton. The address is 879 W. Main St., Silverton. The garden is located a few minutes from Interstate 5, about 40 minutes south east of Portland or 15 minutes from Salem.